Pomapoo – Is The Pomeranian Poodle Mix For You? What’s in this Guide to the Pomapoo? Check out our readers’ most popular and frequently asked questions about the Pomapoo. How much is a Pomapoo? Are Pomapoos good with kids? The Pomapoo is a Pomeranian Poodle mix. Combining the lively Toy Poodle with the adorable, fluffy Pomeranian. Let’s take a quick look at what you can expect from this tiny pup. The best place to start learning about a mixed breed, is with the parents. Mixed breeds have been around for as long as purebred dogs. And since designer dogs are essentially just first generation mixed breeds, they really are not anything new. However, the mixing of two distinct breeds to create a “specialty” dog is something that has gained popularity within the last 20 years or so. And the Pomapoo is one of these dogs, created by breeding the Toy Poodle and Pomeranian. Mixed breeds can retain any combination of physical and temperamental aspects of the parents, so let’s take a closer look at the Toy Poodle and Pomeranian. The Toy Poodle is an offshoot of the basic Poodle breed that has been recognized since the 1800s. While Poodles originated in Germany, many credit the formation of the distinct breed to France. And Poodles are one of the oldest breeds, dating back to at least the 1400s and possibly even longer. In fact, some Egyptian tomb illustrations feature dogs that look surprisingly like Poodles. The Poodle was developed as a canine to hunt waterfowl, like many of the oldest canines. Poodles were selectively bred to create smaller versions of the larger Poodle, and this is where we get the Toy Poodle from. So it is not its own distinct breed, just a tiny version of the Standard Poodle. The Pomeranian is a toy dog breed that originated in the 1800s from the German Spitz canine. The dog is named after the Pomeranian region of central Europe. The dogs were originally larger and closer in resemblance to the German Spitz. These canines were often used to protect livestock and herd sheep. However, Queen Victoria owned a small Pomeranian and the toy version of the dog became quite popular. The much smaller Pomeranians are now the most common. Over the last 20 years, ownership of Poms has increased substantially, making the breed one of the most popular in the United States. What Does A Pomapoo Look Like? Pomapoo adults, like other types of designer dogs, can have a mixed appearance. Attributes come from either the Toy Poodle or Pomeranian parent, which means they vary a fair bit. What we do know for sure, is they are small! When it comes to size, Pomeranians are only about 6 to 7 inches high and 3 to 7 pounds. Toy Poodles are 10 inches or shorter, any bigger and they’re classed as Miniature instead. They weigh about 6 to 9 pounds. So your Toy Pomapoo full grown will be anywhere from 6 to 10 inches high and 3 to 9 pounds. Basically, your pup will be a toy sized one, just like its parents. When it comes to general appearance, again, you may see a combination of traits. Pomeranians have a narrow muzzle, small face, and small ears that sit high on the head and stand up straight. Toy Poodles have longer and more pointed muzzles with small faces, and the ears are long and flop along the side of the head. Pomapoos will often have floppy ears as well, but they are a bit smaller than those of a Poodle. Both Pomeranians and Toy Poodles have unmistakable coats of fur that certainly stand out. So what does the Pomapoo coat look like? Well, it really can resemble that of the Pom or the Poodle, or you might see a mixture. The Pomeranian although usually tan, comes in a lot of colors. Your pup could potentially have any of these, or a cute mixture! The Pomeranian has a soft undercoat covered by more textured hair, and it has a remarkable fluff to it. The Toy Poodle has a thick, dense, and curly coat that is often kept trimmed close to the body. Poodles are famously low shedding. Pomeranians on the other hand can shed like nobody’s business. Unfortunately, the cute little Pomapoo is likely to also be a shedder. And they are not hypoallergenic. Regardless of which parent your Pomapoo dog takes after, you will need to invest in some grooming. Most of the dogs will have a hybrid coat that requires brushing with a slicker brush if the hair is more curly and a pin brush if it is straight. Brushing every day is wise. Additionally, you should think about a Pomapoo haircut every few months to reduce some of the grooming and shedding headaches. 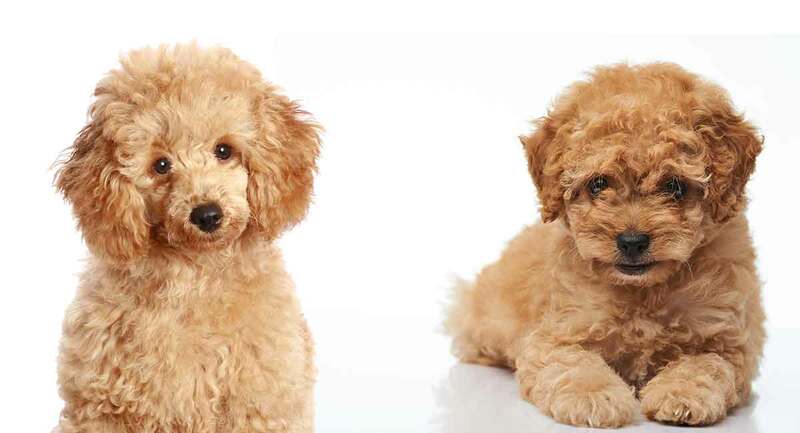 Puppy, lion, and teddy bear cuts are all common varieties to consider and will cut down on Pomapoo shedding. Keep in mind that the cuts do require the expertise of a groomer, and this can substantially raise your overall Pomapoo grooming costs. When it comes to temperament, you may see the Toy Poodle or Pomeranian personality dominate. But either way your dog will be loving and loyal to their family, and pretty clever. Toy Poodles are highly intelligent, loyal, and trainable. They do sometimes have a bit of a stubborn streak, and the dogs are known for their tight bond with family members. 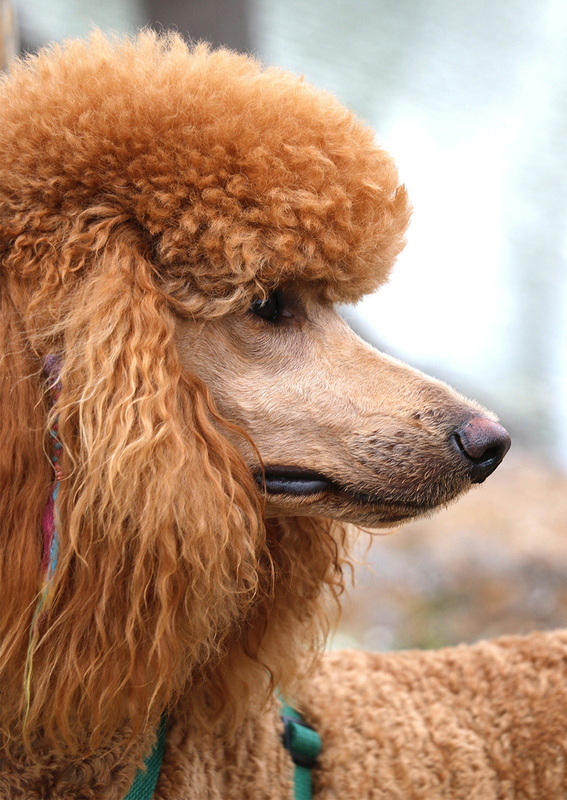 Since Poodles are intelligent dogs, they need to take part in exercise and other activities that keep them engaged. An hour of exercise, at a minimum, is required, and games like fetch should be encouraged during exercise sessions. Pomeranians are extremely affectionate dogs that tend to stay close to their owners and thrive on human interaction. The canines are also quite lively and energetic and need one or two brisk walks every day for exercise. 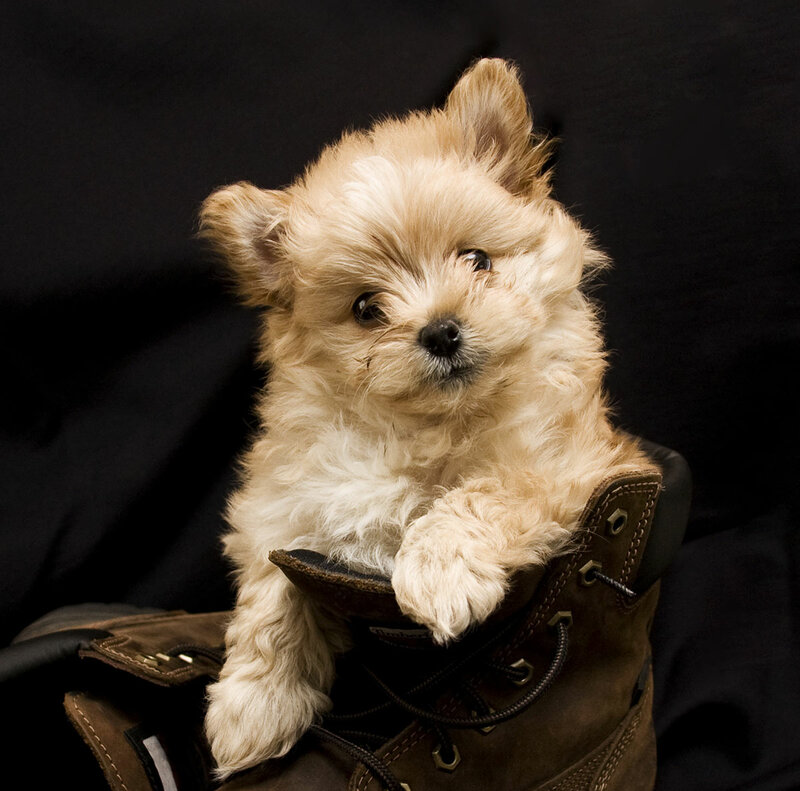 Your Pomapoo is likely to be active, like the Pomeranian and Toy Poodle with daily exercise needs of about an hour. You can expect to see some loyalty and intelligence as well. You should know that Toy Poodles are excellent family dogs. However, Pomeranians will often favor a single family member. So the Pomapoo might not be the best choice for small children. Also, a Teacup Pomapoo may have something called small dog syndrome. However we recommend you avoid these exceptionally tiny varieties. Both teacup Poodles and teacup Pomeranians come with a lot of health issues, not just potential temperament problems. Tiny dogs can act more aggressively than larger ones. But socialization will help to reduce the chances of this. Small dogs can typically take a little longer to potty train. This is in part due to the small bladder size. But with perseverance and a good routine they will get there in the end. Like any other intelligent, confident dog they will benefit hugely from positive reinforcement training. Set them up to win, make training rewarding and it will be a fun and bonding experience for you both. You can even have fun teaching them tricks! These small dogs are still pretty lively, and need regular walks and plenty of play time. They can be taught to fetch and even to take part in dog sports like agility, just like their larger counterparts. You will however need to be careful, as with their small stature they can be vulnerable to accidents. So if the Pomapoo sounds like the ideal dog for you and your family, there is one important thing you need to consider: potential health issues. Health problems can come from either parent, so you need to understand some of the common problems seen in both Pomeranians and Toy Poodles. When it comes to the Toy Poodle, eye issues can develop that include cataracts and progressive retinal atrophy (PRA). According to research studies, PRA is common among 100 different dog breeds. It is a hereditary issue that causes degeneration of the retina over time, and blindness can accompany PRA as it progresses. Poodles are sometimes prone to hormonal ailments as well, like hypothyroidism. The disease is caused by reduced levels of the thyroid hormone and can cause weight gain, hair loss, and digestive problems. Another common hormonal issue includes Addison’s disease where the adrenal glands do not produce enough of the cortisol hormone. This issue can cause anxiety, depression, digestive issues, and lethargy. Seizures as well as some orthopedic problems, like hip dysplasia and patellar luxation, can sometimes occur. Both of these problems can affect the way your canine walks. Pomeranians can also develop hip dysplasia and patellar luxation and ailments of the eye like cataracts. The inward growth of the eyelashes can pop up as well. Pomeranians can be prone to hypothyroidism too, and they can develop a condition called severe hair loss syndrome, which is similar to alopecia in humans. Tracheal collapse is a congenital condition to be aware of. If the cartilage rings that line the trachea collapse, so does the airway. This can cause a disruption in the Pomeranian’s ability to breathe and general lung issues, like the accumulation of mucus in the lungs or a condition called bronchiectasis. Some Pomeranians have dental problems too, and this is caused by the overcrowding of the teeth in the small mouth of the dog. Cavities, gum disease, and bad breath are the result. To ensure your Pomapoo is as healthy as possible, make sure each parent is health tested for the conditions relevant to their breed. If they are a second generation mix from Pomapoo parents, then they need to both be checked for all of them. This is because as it’s such a new mix, we don’t have studies to rule out any potential hereditary problems. Do Pomapoos make good family pets? This cute little Pomeranian Poodle mix can fit well into some families. They are loyal, loving and intelligent. But they are also very small. This makes them not ideal with families with tiny children who accidentally be rough, or trip over them. Kids over the age of 12 should do fine with supervision. Just remember to give your pup space, and to not let them get over tired. Pomapoos don’t come up often in rescue centres, but it is possible to find one that needs rehoming. With older dogs you may or may not have a history to go on. They could have come from a marriage breakdown or the sad departure of an owner, or been rejected due to temperament issues. Although it can be risky rehoming, it’s also a great thing to do for the dog. And reputable centres will help you to select a dog that is a good fit for you and your family. Although you aren’t likely to find a Pomapoo specific rescue, here is a list of breed rescues in USA, UK, Australia and Canada that specialize in Pomeranians and Poodles. Of course, you might well prefer to take on a Pomeranian Poodle mix puppy instead. 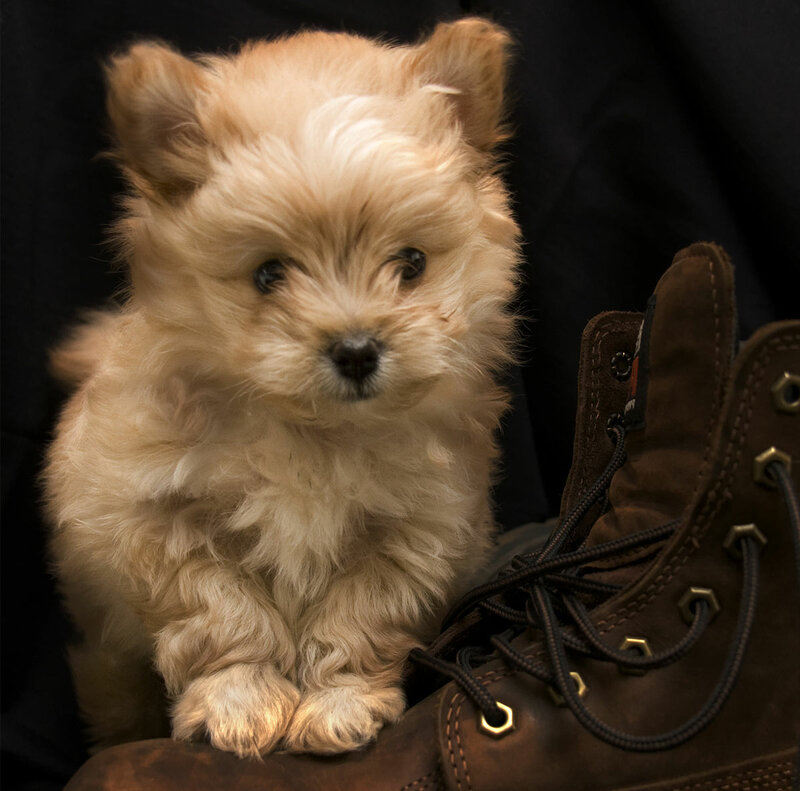 So you think that a Pomapoo puppy might be right for you? Finding a designer dog breeder is not difficult, but you do need to make sure that you find a reputable one. 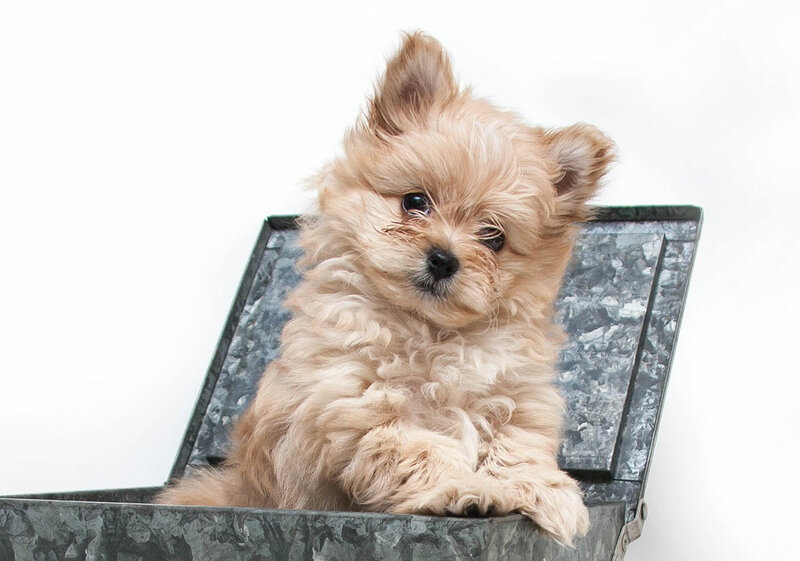 Before committing to a pup, make sure any Pomapoo breeders you consider can supply the full veterinary records for the mother and father. A lineage should be supplied as well, and ideally, the breeder should be more than happy to supply DNA test records. This type of testing will show whether or not the breeding dogs have genes for hereditary diseases. Eye, bone, dental, hair, or gastrointestinal concerns are particularly relevant with this mix. Meet both parents and make sure they are friendly and relaxed around strangers. How much does a Pomapoo cost? Well, they don’t go cheap! In fact, you should be wary of any breeder who offers a low price for a Pomeranian Poodle mix. Typically, you can expect to pay anywhere from $500 to $2,000 for a puppy. You will notice higher costs if the breeder supplies full medical records and DNA tests for the mother and father. It is well worth the cost knowing that your new furry pup is more likely to be healthy. Caring for a toy sized puppy is a big responsibility. Fortunately, we have some great free guides to help you along the way. Check out our main puppy care section here for help and advice on potty training, biting and much more. As a small mixed breed, your pup will need some special items to help take the best care of her. Many of our general small dog products are perfect for the Pomapoo too! It can be hard to pick a particular breed or mix. Sometimes, making some quick pros and cons can really help! Still not sure a Pomapoo is right for you? Here are some similar breeds! If you love the idea of a small Poodle mix, but are concerned about the health problems of the Pomeranian, here are some other lovely mixes. You can find a huge range of other adorable small Poodle mixes here. Strain G. 2004. Deafness prevalence and pigmentation and gender associations in dog breeds at risk. The Veterinary Journal. Goldstein et al. 2006. Linkage disequilibrium mapping in domestic dog breeds narrows the progressive rod-cone degeneration interval and identifies ancestral disease-transmitting chromosome. Genomics. Gelatt and MacKay. 2005. Prevalence of primary breed-related cataracts in the dog in North America. Veterinary Ophthalmology. Bromel et al. 2006. Comparison of ultrasonographic characteristics of the thyroid gland in healthy small, medium and large breed dogs. AJVR. Milne and Hayes, 1981. Epidemiologic features of canine hypothyroidism. Europe PMC. Burback et al. 1996. Surgical treatment of tracheal collapse in dogs: 90 cases (1983 – 1993). Europe PMC. My pompoo is 8 yrs old. She is very attached to me as an owner. But she does have a pinch of a stubborn streak on occasion. I try to get her to give me a kiss [lick } but won’t I never can figure out why. She sleeps with me under my covers and has horrible separation anxiety when I am gone. Why will she not give me kiss? We love Moxie, our pomapoo! She is 13 years old, very healthy, adorable looking. She is aptly named; her 6 lbs of self is energetic, friendly and loving. She barks when someone knocks on the door but is not tippy. She loves going on walks and being social w other dogs but when we pick her up, she becomes a lap dog. ? My pomapoo is 2 years old and I came across her by chance when looking for poodle mixes as growing up, we always had poodles. She is honestly the sweetest, most loving, funny and intelligent dog I have ever met. She adores both me and my husband. As my husband says ‘he can’t imagine his life without her’. She is my perfect dog. So i have 16 year old Pomapoo, he was born 10/3/2002. He is still with us. The best dog ever. Still active. i stop feeding him form cans. When he was 7 years old we almost lost him. So since his health problem after cans food. We start cooking his food. He had heart attack 3 years ago and he is still with us and still fully active. We own a pure Pom and a pure mini poodle. They are two of the best dogs I e had the pleasure of being loved by in my life of dogs . My mini poodle is hypothyroid. One day I might get a combination of my 2 favorite pups. I never had a pomapoo but pomeranians are the sweetest most loving lap dogs you could ever want. They are super attached to their special person and dont have much use for anyone else, but if you are that special person you know that there is no love like pom love! I had a pamapoo for 4 yrs. and a little over a year ago he had to be put down because of cancer of the spleen . I am still not over the fact that he is gone. I lost a part of my heart when he passed. I loved him so very much!